The American church historian George Marsden is currently delivering the Stone Lectures here in Princeton. (The lectures are being blogged – see the series of links here.) 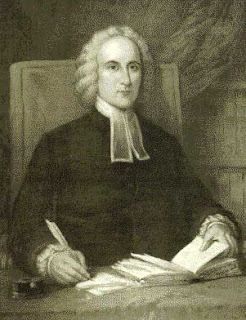 Marsden, author of the great biography on Jonathan Edwards, is creating a dialogue between Edwards’ thought and contemporary theological issues. Although I admire Marsden’s work on American church history, I was very disappointed by the methodological framework which he set up in the opening lecture. He asked how we can learn from someone like Edwards, whose views are obviously outdated and offensive in many ways. Marsden’s answer was that we can access Edwards’ lasting insights by distinguishing between his great “perennial ideas” (e.g. his doctrine of the Trinity) and his outdated nonessential ideas (e.g. his biblical literalism, his millennialism, and so on). In contrast, the point of historical study (as Rowan Williams has compellingly argued in Why Study the Past?) is to encounter the past in all its irreducible strangeness — and yet to perceive this strangeness itself (not some timeless “core”) as something that was actually possible for the Christian church. In other words, we need to recognise even Edwards’ most unpalatable ideas as things that it was possible for a Christian to think and say. If we can do this, then we’re placed in a position where Edwards can challenge and question our own most basic assumptions about what counts as “Christian”. As Karl Barth remarks in his work on 19th-century theology: “I have to count all these people as members of the Christian Church and, remembering that I and my theological work are in the Christian Church only on the ground of forgiveness, I have neither to dispute nor even to doubt that they, like me, were ultimately concerned with the Christian faith” (p. 28). Once we perceive that a thinker like Jonathan Edwards was “ultimately concerned with the Christian faith,” it becomes impossible to distinguish between any timeless “core” and the mere “husk” of culturally-bound ineptitudes. Instead, by encountering the strangeness and offensiveness of Edwards’ ideas, we are encountering something new and unexpected about the nature of Christian identity itself. And this means that our own assumptions about Christian identity have also become less certain and less secure. Edwards is now not merely a curiosity or the source of a few timeless verities; now, he becomes a question to us.